You’re invited to the “Chess Diva” Chess-Haiti Fundraiser! 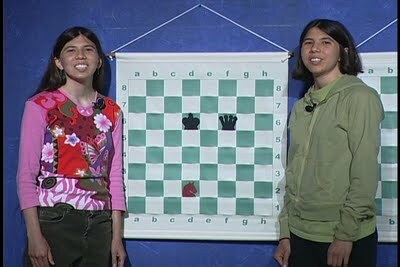 Nationally ranked chess players Barbara and Lauren Goodkind, producers of the award winning local access TV show, “Chess Diva” will play 5 minute blitz games with the public. Non chess players will find it entertaining to watch! Parents, bring your kids! Suggested donation per game is $5. the producers of "Chess Diva"
Lauren has been playing in chess tournaments for about 8 years. Her current United States Chess Federation is 1859. After graduating recently from a 4 year university with a BA in communications, she decided to work with the chess community and pursue a career in media production at the same time. "Chess Diva" is one of her first projects. She gives a lot of credit to the Media Center in Palo Alto, which made this effort possible. Barbara was first of the sisters to play in chess tournaments. She currently attends a 4 year university to obtain her BA degree. Lauren and Barbara Goodkind are ranked among the top 100 females in the United States (see top rating list).